You don’t need to undergo extensive surgery or even take time off from work to reduce the signs of aging. Treuvís Eyes Nails Body Laser Spa in Clinton Township, Michigan, offers skin tightening to smooth out those lines using advanced radiofrequency energy. To schedule your skin rejuvenating treatment, call the office today or book online. The skin tightening treatments are so safe, any part of your body can benefit from them, including the delicate skin on your hands. The skin care specialists at Treuvís Eyes Nails Body Laser Spa use radiofrequency energy to tighten and rejuvenate your skin. Radiofrequency energy is a type of energy measured in wavelengths and has many different uses, including sending WiFi signals to your smartphone and heating up the food in your microwave. With advances in medical technology, radiofrequency energy is used to improve the health and look of your skin. Radiofrequency works by sending heat energy to the deep dermal layer of your skin. The heat causes the cells in the tissue to constrict, creating an instant tightening effect. The heat energy also stimulates the cells in your dermis to increase its production of collagen and elastin, which are the proteins in your skin that provide support, strength, and flexibility. What can I expect from skin tightening treatment? Skin tightening treatment at Treuvís Eyes Nails Body Laser Spa is a relaxing experience that provides instant results. During your session, your specialist places the radiofrequency wand over the treatment area and allows the energy to stimulate your skin to produce the desired effects. Unlike other types of beauty treatments, you shouldn’t experience any discomfort during your skin tightening treatment. There’s no downtime following your skin tightening treatment, and you can go right back to your day after your session. You may notice some redness and swelling in the treatment area, but these side effects should disappear quickly. You should see an immediate improvement in the look of your skin following your skin tightening session, and the improvements in your skin continue as the cells turnover, revealing a younger, healthier look. To get the best results you may need a series of skin tightening treatments. Your specialist at Treuvís Eyes Nails Body Laser Spa can discuss your needs at your consultation, so you know what to expect. Skin tightening can improve your look instantly without downtime. 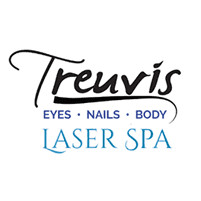 Call Treuvís Eyes Nails Body Laser Spa to schedule a consultation or book online.